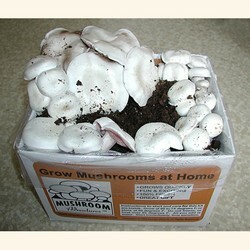 Dense White Mushroom Kit from Mushroom Adventures. Grows mushrooms at home. This product is New, we are the manufactures. Shipping charges are calculated at time of check out. Dense White or Agaricus bitorquis. This is one of my favorites mushrooms for the shear size and durability of the mushroom. Its flavor is similar to that of the white button mushroom, but it will not cook down as much and is a little chewier. It is a denser solid mushroom. It often can attain extremely large sizes, 5-8 inches in diameter and the caps can get to be two inches thick. The average size is 3-5 inches. This is a truly white mushroom and is resistant many mushroom viruses. It will grow at cool temperatures and in warm temperatures. Its fruiting range is between 55-80 degrees F. For a while it was grown as a commercial mushroom, but later gave way to A. bisporus, the current white button mushroom. No matter what they are called they taste great. The kit is complete all you add is water. Kits are time sensitive and should be started within 10-21 days after there start date. Start dates can be delayed if the kit is refrigerated. These mushrooms are grown on pasteurized compost and do not smell. All mushroom kits can to some degree attract small fungus gnats this is normal. Shipping charges are calculated at time of check out. Shipping Weight: 12lbs. / Grows up to 4 lbs. of mushrooms total.